You name it, The Royal can accommodate you and your guest. Don't miss out on these great specials!!!! 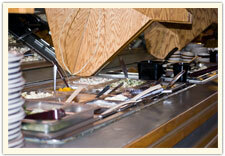 The Royal has a great all you can eat lunch buffet starting at only $8.99. Start with our fresh and delicious homemade salads (veggie salad, potato salad just to name a few) lettuce and all it's topping. 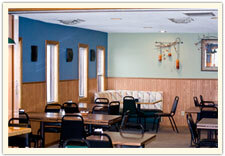 The menu varies daily except Wednesday we always have our Fried Chicken, potatoes, gravy and veggie. End with our homemade soups. You can even request your favorite item or dish for a special day to have on our buffet if you would like just give us a call and we will try to accommodate your needs. 320-632-6401. 7am to 11am –Breakfast special is 2 eggs, meat and toast. Double punch day earn your rewards to receive great discounts. Pie Tuesday all pie is a dollar off a slice. 7am to 11am – 2 slices of our thick Royal French toast served with 2 piece of bacon. 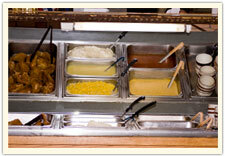 11-2pm – Lunch Buffet - Fried Chicken with potato, gravy, veggie and full soup and salad bar. Kids Eat Free: Kids 10 & under will receive a free meal with the purchase of an adult meal. 7am to 11am – Stuffed hash browns – loaded hash browns with cheese and eggs. 6am to 11am – ½ biscuit and gravy with 2 eggs. 6am to 11am – Country fried steak served with 2 eggs, hash brown and toast. 4:30-7:30 – Build your own burger buffet with tater tots, beans, and our full soup and salad bar. 4:30-7:30 – Italian Buffet featuring lasagna, spaghetti, pizza, chicken alfredo, and our full soup and salad bar.